I first heard about When Dimple Met Rishi months ago when Preeti Chhibber started talking about an upcoming YA romance novel about two Indian kids at a computer coding camp whose parents have decided to play matchmaker. That sounded a) adorable as all get-out and b) yaaaas, #ownvoices book about two nerdy kids. Yes, do want, kthanks. Would you be surprised if I said that basically anyone who walks into our teen section at the store gets this book handed to them? You shouldn’t be. 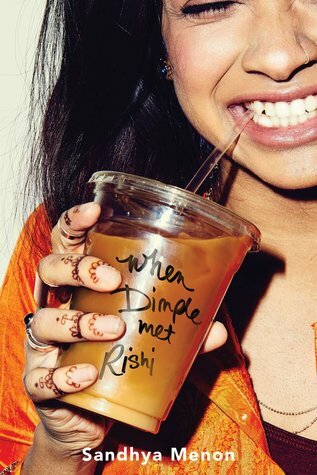 Because When Dimple Met Rishi is the most adorable, a-dork-able romance I’ve read in a long time. There’s comics, coding, cosplay, generalized nerdery, and Bollywood. Dimple and Rishi are such great characters who are very smart but also have a lot of life experience to live through, too. Dimple is extremely angry at her parents for this matchmaking scheme (particularly her mom, since her mom’s sole purpose in life seems to get Dimple to be more girly and snag an Ideal Indian Husband); she doesn’t have time for a relationship, she’s going to focus on her career to develop great apps and software to help people. Rishi, who is of a more traditional mindset, is determined to be a successful engineer so that he can take care of his parents later on, even if that means depriving himself of a creative outlet that he loves. I loved the secondary characters of Dimple’s roommate Celia and Rishi’s brother Ashish. But in and around the central romance plot, there are some really sobering scenes with the local rich douche-bros and some casual racism and sexism; Menon uses these really tough scenes to highlight how hard Dimple has worked and how people like to pigeon-hole brown kids. I loved it – such a good book. If this book does not make you grin with delight there is no hope for you. Definitely a comp for fans of Fangirl, given the characters’ are edging out of teenage years and into adulthood. From Duke Till Dawn is a wild ride! We have a Duke in love with a pretty widow who captured his attention then disappeared but turns up months later as the manager of a pop-up gaming hell…who spins a few more glib stories but her house of cards soon collapses. The pretty widow is really a con-artist, skilled at getting rich men to “help out” a destitute young widow desperate for a few hundred pounds to get her out of a jam, more familiar with the gutter than the ballroom. The Duke, Greyland, is understandably pissed off at her, not so much for cheating him out of money but for abusing his trust (and maybe breaking his heart). Cassie was hoping this gaming hell gig would be her last job, a way to get out of the grind and lead a life free of lies. But when her business partner – her supposed friend and mentor for many years – disappears with the takings from the gaming hell, leaving Cassie in mortal danger, she’s forced to throw herself on Greyland’s mercy. This is a cross-class romance that gets rather adventurous (in more ways than one) and has some real stakes. I really liked the problem presented by making the heroine a grifter who had made the hero a previous mark – it turns the meet-cute on its head and presents a real problem of social, moral, and personal tangles to the resolution of a Happy Ending rather than just those pesky “three little words.” Ellingsworth and Langdon were a hoot as the comic relief – I can’t wait to see what Leigh has in store for them. The accident cracked Isadora’s life in two: on one side, the brilliant young talent who captivated audiences the world over; on the other, a heartbroken mother spinning dangerously on the edge of sanity. I’ve been very interested in this novel for a while. Isadora Duncan is an absolutely important figure in the development of modern dance and in breaking away from the classical ballet tradition. She’s also a tragic figure in the discipline, first losing her eldest two children to an accident and then dying of a broken neck when her scarf is caught in a car’s axle. Of course, I would want to read a novel based on her life. This didn’t quite pan out. 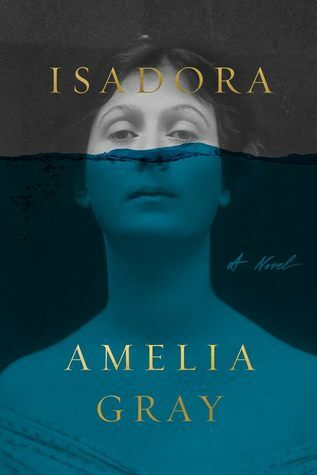 There’s an interesting biographical novel somewhere in Isadora, one about grief and loss and art, but it’s bogged down by the style. The novel begins on the day that Isadora’s children drown in a car accident in the Seine and spans the next 18 months or so told by a rotating cast of 4 characters: Paris Singer, Isadora’s lover and father of her younger child; Elizabeth, Isadora’s sister; Max, Elizabeth’s lover (maybe her lover, maybe not?) and a teacher at the Duncan school in Darmstadt; and Isadora Duncan herself. There are also other characters coloring the narrative, the Duncan matriarch, another Duncan sibling and his wife, students of the Duncan school, and so on. Now, the major snag here is that Isadora narrates in the first person and everyone else in a close third person point-of-view, with some letters mixed in between chapters, and that makes it absolute hell to read. Also, while some of Paris’s sections were interesting, absolutely none of Max’s sections were worth reading, in my opinion. Isadora’s sections are the strongest, and most beautiful, with Elizabeth’s a perfect contrast as the sister always in the shadow. If I could take a knife and snip out everything else leaving only these two sister narrators (and magically make Isadora’s sections a close third POV) this would be a marvelous novel. Somehow, I had not run across Samantha Irby, a writer/humorist from Chicago, on the Interwebs. 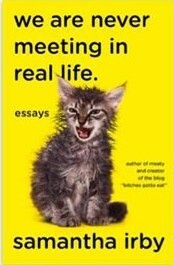 (No lie – I saw the cover with its grumpy kitten and was like SOLD, I wonder who wrote this.) we are never meeting in real life. is a very solid collection of personal essays ranging from hilarious (her bachelorette contestant application) to the stone-cold sobering (a phone call at college informing her that her father is missing, possibly dead). 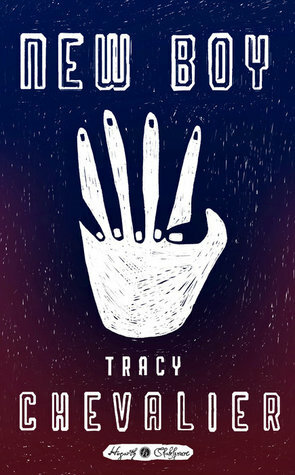 The arrangement of essays is very clever, moving us from topics we grasp easily – and easily chuckle over – moving through gradually harder subjects as Irby reveals to us – always with a quip – who she is as a queer, disabled black woman. She will cut you to ribbons with her words then enjoy a marathon of Real Housewives in her pajamas without a second thought. I think my favorite piece was the one about the Civil War reenactment she ran across while in Naperville for a wedding. Definite recommend. we are never meeting in real life. is out May 30th! Edited to add: Congrats to Irby on her TV deal for her previous book, Meaty! 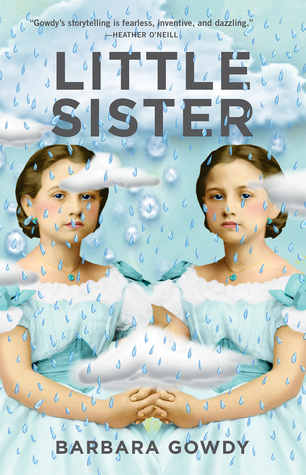 Little Sister is one of those books that has such a good premise and idea behind the characters but then gets really underserved by the construction. The book takes so long to get to WHY Rose becomes so obsessed with Harriet and how the two of them might be connected (or not) that I was having trouble staying with the story. And then it doesn’t really dig into whether Rose was actually having visions, or just migraines, or if there truly was something supernatural. For a short novel it should not have taken me this long to read. The mother, Fiona, was a great character and one of the few times that I’ve read an aging parent with dementia who is portrayed sympathetically but also given a three-dimensional personality beyond the mental deterioration. Dear FTC: Thanks to Tin House Galley Club for the ARC. 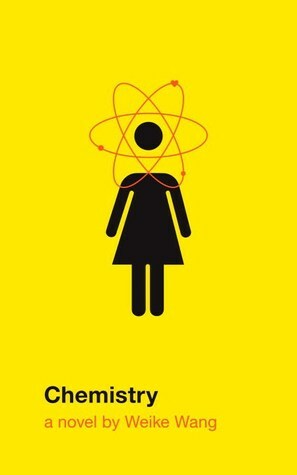 Praised by Ha Jin as “a genuine piece of literature: wise, humorous, and moving,” and perfect for readers of Lab Girl and Celeste Ng’s Everything I Never Told You, a luminous coming-of-age novel about a young female scientist who must recalibrate her life when her academic career goes off track. Chemistry is a book that fits in between Dear Committee Members and Dept. of Speculation – which is an intersection that I didn’t know I needed. I really enjoyed the narrator as she winds up having to break almost everything in her life from her academic career to her long-term relationships before she can figure out who she is or what she wants. The writing is very wry and there’s a lot of science and chemistry (NERD CRED FTW). I had some trouble at the beginning with the tenses – present tense is used for EVERYTHING, including events from the narrator’s childhood, and I found that kind of annoying. Margaret Maguire—a widow and grandmother, home from the hospital in time for Christmas—is no longer able to ignore the consequences of having married an imperious and arrogant man. Despite her efforts to be a good wife and mother in small-town Iowa, her adult children are now strangers to one another, past hope of reconciliation. Margaret’s granddaughter could be the one to break the cycle, but she can’t do it without Margaret’s help. It’s time to take stock, to examine the past—even time for Margaret to call herself to account. By turns tenacious and tender, contrary and wry, Margaret examines her life’s tragedies and joys, motivations and choices, coming to view herself and the past with compassion, if not entirely with forgiveness. Beautifully rendered and poignantly told, Evensong is an indelible portrait of a woman searching for tranquility at the end of her days. While perusing catalogs, I came across a book set in Iowa. Gimmie. 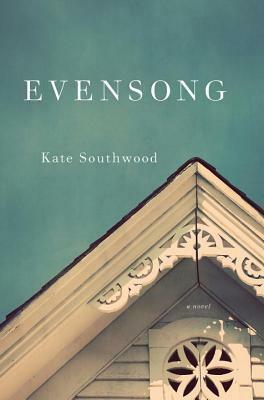 Evensong by Kate Southwood beautiful, quiet, slowly unfolding story about an elderly woman near the end of her life. As she recuperates from a heart attack, she contemplates the consequences of her choice of husband who died decades ago when their two children were young (nothing squicky, just not a great person, in the end). The family dynamics here are very intricate – encounters are either commonplace or fraught with tension between the daughters and grand-daughter. Anyone who has had that awkward holiday dinner with the one overachieving weirdo relative that everyone else is winding up will understand. Although I picked up Evensong specifically because it is set in Iowa – a fictional town somewhere down near Ft Madison – and it isn’t specifically evocative of place, it very much deserves its comps to Marilynne Robinson’s Gilead with with the focus on a long life, family, and the past.